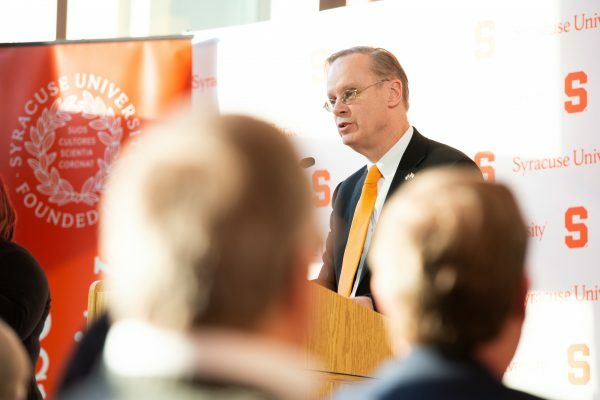 Chancellor Kent Syverud spoke of the many reasons for Orange pride and four important goals for the next six months in his Winter Message, which he delivered on Monday, Jan. 14, to a standing-room-only audience in the Jack and Laura Hanhausen Milton Atrium in the Life Sciences Complex. The Chancellor talked about one of the hallmarks of Syracuse University: student engagement in the community, with alumni and on campus. And he described important goals involving academic excellence; the student experience; diversity and inclusion; and the University’s upcoming sesquicentennial. Chancellor Syverud spoke after, and was introduced by, Student Association President Ghufran Salih ’20. Below is the text of his remarks. Thank you, Ghufran. I feel a challenge to now come up with a more vibrant Orange with you this semester. Good Afternoon. Welcome to 2019 and to the start of the spring semester at Syracuse University. I think Ghufran was referring to a beautiful day, as being this cold. But this is beautiful for January, and I approve of it. I want to reflect a bit today on how far we have come in the first half of this academic year and to remind us of some major common goals for the semester ahead. I first give thanks to all of you who have contributed so much at our university in the six months just past. By almost any metric, our University is doing well—including by the quantity and quality measures of academics, and of research, and of enrollment, in our finances, in our student experience, in our engagement with the community and the world. Given everything that is going on out there in the world, I think it is worth us pausing a bit in gratitude that the University is doing so well. Most of the time, most of our university community can and has modelled what the world needs right now and needs more of. At our best, we have been an inclusive and academically rigorous place where people from all over the world, and of all backgrounds, can learn from and with each other, and can work together to make this world a better place. More than at any time since I have been at Syracuse, people lately have been telling me they are proud to be Orange. Part of that, of course, is the joy many feel in seeing our football team go to and win a bowl for the first time since 2013. I felt that joy this past holiday season too, and I am grateful to our student athletes and all who worked with them to make that bowl win happen. But I want you to know people have been telling me they are proud to be Orange for many more reasons, lately. They are proud of our campus, they are proud of our academic programs, they are engaged as alumni and friends, they are proud of what people are doing here. They have started to notice, for example, that the University genuinely does care about, for example, veterans more than other schools. Over the holidays, Joe Guardonolo who is a longtime and beloved member of our University’s professional staff, gave me a family treasure and this is it: if you can see it in the back it’s pretty small. This is a copy of the student rule book for Syracuse University. It was the rule book that every student in this university was required to carry around with him or her at all times in 1923. And this is Joe’s father’s treasured copy of this rulebook, that his father saved all his life. So one thing I just want you to note about this rule book, how many fewer rules there were at this University in 1923. The other thing I want you to note in it, if you read it, and I can show it to you after this speech, is that even back in 1923, it really mattered to people to be Orange. They were constantly talking about what it meant to be Orange in this book. And here is one just one example of that. Here is one of the rules in the rulebook—and by the way, they were enforceable back then by every senior on campus: No member of the freshman or sophomore class was allowed to wear Orange, except at athletic events. That’s one of the rules. Only juniors and seniors could wear Orange. And I find this interesting. I find this interesting because first it says, almost 100 years ago, it was regarded as an honor to be and to wear Orange, and an honor to be earned. But second, even though we believe that Syracuse was an inclusive place compared to other schools back in the 1920s—after all, back in the ’20s no quotas based on religion, and no race and gender restrictions in admissions—even though we were inclusive by the standards of those days, we have clearly evolved since then, and we’ve evolved even in simple things like who gets to wear Orange and when. So our values do evolve at Syracuse, and yet they remain captured by continuity and pride in being Orange. I have no doubt people in 1919 would be surprised by part of what it means to be Orange today, and I have no doubt that we would be surprised in 100 years if we could see what “being Orange” means in 2119. One of the hallmarks of Syracuse University right now is that our students engage with others in our community, with alumni, on campus—in ways that the authors of this Rulebook in 1923 really could not have imagined. Just one example, last semester three students from the iSchool, Kahssia Hills, Malaika Howard and Sydney Paul worked with alumnus Alyssa Newton to initiate a “Girls Who Code” chapter at a library here in the City of Syracuse. This a national program that introduces tech careers and coding skills to young women. After several weeks of study, participants, girls in the program, choose a problem facing our community and determine how coding can be used as part of the solution. The girls involved in this program go onto major in computer science at 15 times the average rate of other girls going to college. Being Orange means looking beyond our campus for ways to make a difference in new ways. Looking forward, being Orange for the next six months, I believe, includes accomplishing some important goals in four specific areas: I can’t name all of them in each of these areas, but I can give some highlights. I want to talk in academic excellence, I want to talk about the student experience, I want to talk about diversity and inclusion, and I want to talk about preparing for our 150th birthday, our sesquicentennial. So first let me talk about academic excellence. Academic excellence is and always has been, central to our mission and to being Orange. It is essential that we continue to be a rigorous center of learning and a global center for high quality research. To that end, we must continue to focus on and invest in faculty and in graduate and undergraduate research. Just before the holiday break, Syracuse University for the second time earned a position in the very top tier for research activity among all universities in the nation. Our campus is one of 120 R1 doctoral universities in the country, according to the just released Carnegie Classification of Institutions of Higher Education. Our research activity has been growing, and it has been growing faster than most of our peers, since 2015. Looking forward, Syracuse University in the coming months, and in the two years that follow, is making an unprecedented investment in faculty recruitment and faculty retention. It is critical that we get this right. 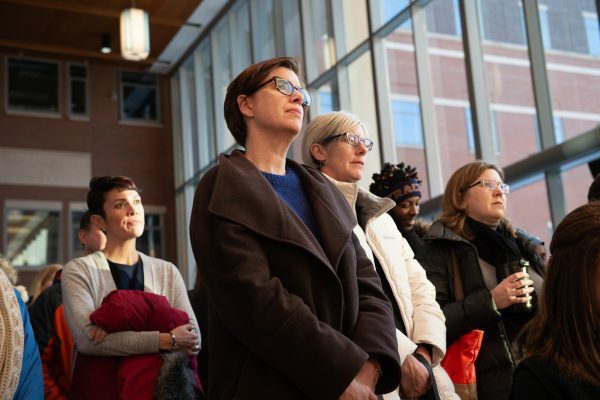 The Invest Syracuse funding of 100 new faculty lines has been extended, through cost sharing with schools and colleges, to 200 new faculty lines. This is a dramatic expansion of our faculty, the biggest in decades. Signature hires are being made in areas where a distinguished scholar-educator can make a substantial impact in fields related to the University’s strengths. Thirty-three of these signature hires were approved for this year across all colleges and schools. The recruitment in process must be successfully completed. The Cluster Hire committee has also selected seven clusters through a competitive process, which will fund 53 total new faculty lines. Cluster hires are hires of multiple scholars into at least two schools or colleges in related areas, based on shared, multidisciplinary or interdisciplinary research interests. The initial round of cluster hires, which has to get started very soon this semester, will begin shortly in the areas. There’s seven of them: Aging, Behavioral Health and Neuroscience; Autonomous Systems and Policy, Artificial Intelligence, and Deep Learning; the third, Big Data and Data Analytics; the fourth, Bio-enabled Science and Technology; the fifth, Energy and Environment; the sixth, Innovation and Entrepreneurship; and seventh, Social Differences and Social Justice. These are vital faculty recruitments and retentions. If we get them right, they will build and define our University for many years, beyond the lifetime of most of the current faculty. These signature hires are of great teachers and scholars and these cluster hires are in areas where we have strength and can be distinctive. This spring you will also be hearing more about how we are formalizing two new centers: one for autonomous systems and a second for infrastructure. Within the next 10 years, technologies such as drones, self-driving cars and smart-homes are predicted to grow to a global market size of more than 14 trillion dollars. However, our world has not addressed the impact these systems will have on society, on our law, on our policy, on our governance. We are working this coming semester to create a truly interdisciplinary effort that draws on many schools and colleges to launch a center dedicated to shaping the frameworks that guide the adoption of these technologies to our world. The other area of emphasis this coming semester is on our country’s infrastructure. While many current infrastructure systems were designed and built in the 1960s, our nation’s population has doubled since then and our values have changed since then. We are facing infrastructure deficiencies that impact the health and growth of our society and the economy in many portions of our community. To address these challenges holistically, Syracuse University is launching a new multi-disciplinary Infrastructure Institute. This semester we are also enhancing academic excellence in other ways. In particular, we are focused on deepening opportunities for students to contribute to research in these and other areas. For undergraduate students, there is now a clear path to participate in research that has not existed before—particularly outside the STEM disciplines. As a result of a $1M annual contribution from Invest Syracuse, the Office of Undergraduate Research—now open in Bird Library—will foster a culture of undergraduate innovation and discovery. I am pleased to announce that this office will open up a grants program this week. Applications will be due in the third week of February. Undergraduates will have the opportunity to apply for $2,500 summer grants or $5,000 academic-year grants for sustained research and creative work. For graduate students, this semester we are creating the Research Excellence Graduate Funding Program also through Invest Syracuse. This initiative will award $750,000 annually to help fund approximately 30 additional doctoral students each year at Syracuse University. The goal here is to expand access, to open opportunities to underserved populations and to support the University’s goal of increasing doctoral degree conferrals within high-performing programs. Academic excellence efforts this semester also require us to search for, and select well, two new deans. The iSchool’s Dean Search Committee has begun the search process in anticipation of the planned retirement of Dean Liz Liddy. During Liz Liddy’s remarkable tenure as dean, the iSchool has flourished, and has developed several of Syracuse University’s most distinctive programs and areas of scholarship. I believe in the iSchool. I’m confident the search committee will find the right candidate that continues the iSchool’s groundbreaking culture, and teaching and scholarship in this fast-moving and increasingly high-demand area. The College of Engineering and Computer Science is also searching for a new dean. Dean Teresa Dahlberg is assuming the role of vice chancellor and provost at Texas Christian University, after years of hard work on behalf of Engineering and Computer Science. I congratulate Dean Dahlberg. I thank Professor John Isik for standing forward to serve as interim dean. The next dean of Engineering and Computer Science is a vital appointment to our whole University. I trust that we will recruit a great dean who will continue to expand the scope, quality and accessibility of STEM education for both students and faculty. Provost Wheatly is in the process of consulting with faculty and other stakeholders about the search committee. Provost Wheatly and I will be meeting with ECS faculty on Friday, and I expect a search committee will be appointed by the end of this month. Let me turn beyond academic excellence now, and talk about a second way we are committed to being Orange and that is in our efforts to improve the student experience. One focus, this fall, was our implementation of a shared first-year experience. The goal is to engage first-year and transfer students in conversations and activities that build community, that improve cross-cultural skills and increase awareness of healthy habits and thus help reinforce some common values inherent in being Orange. Part of that course, a shared reading of Trevor Noah’s book, “Born a Crime,” allowed students to examine themes of identity, belonging, diversity, inclusion, and health and wellness. I have listened carefully to a lot of discussion about where this approach was successful and where it might have fallen short. There is lively disagreement as to whether this course will produce the outcomes we want. That discussion is necessary, appropriate, and I would argue—a crucial part of our job as scholars, as learners, as educators. A survey of students indicates that the majority found the experience rewarding. The survey also pointed out several areas where there is room for improvement. The course is still a work in progress. I look forward to learning more as our faculty, staff, and students work together to further refine the course. This semester is a good time to reflect on that. On what worked—what might work better— and how we can improve the first-year experience in this regard. Another important part of the student experience lately is interaction with our university’s financial and administrative offices. This fall, there were changes at the federal level that, in some cases, increased significantly, the documentation burden for students who receive financial aid. This, in turn, affected the speed of financial aid being processed and impacted student registration for this semester. Those concerns were brought forward and discussed helpfully in the University Senate. Since then, many in the University have engaged in intensive outreach to affected students to assist them and clear any registration holds. At this time, I am happy that fewer than 114 register holds remain of more than 15,000 undergraduate students eligible to register. I think that’s better with our past, I am grateful for this progress. But I also look forward to the Provost working with the Senate Agenda Committee, to establish an ad hoc work group to propose alternatives to financial holds and suggest enhanced practices for the long term. Being Orange in this area means doing even better than most of our peers are doing. Another area of attention this semester is Greek Life. I want to briefly share key findings of the external review of Greek Life that occurred last year. The reviewers identified five strengths of Greek Life at Syracuse University: Panhellenic Council Recruitment, Philanthropy, Hands-On Community Service, Fraternity and Sorority Affairs Advisement of Culturally Based Chapters, and Greek student events at the Schine Student Center. In these areas, we want to maintain and improve our current initiatives. There were, however, six areas of concern in the review. They were, first, the organizational structure and operational practices in the Office of Fraternity and Sorority Affairs; second, the effectiveness of communications, particularly around policies, dialogue between Greek organizations and the University, and with parents; third, Diversity and Inclusion both within Greek chapters and across the spectrum of Greek organizations; fourth, Law Enforcement Jurisdiction, particularly concerns about parties and event security; fifth, Hazing and High Risk Behavior; and, finally, sixth, Unrecognized Groups and their lack of accountability to national organizations and to Syracuse University and its community. The Executive Summary of this report will be shared with our campus community later today in a communication from Senior Associate Vice President Rob Hradsky. The summary will outline in more depth the areas of concern and also provide additional specifics on how we will go about addressing these issues. We know, I know, that changes of this magnitude cannot be addressed in one day or in one semester. This external review does provides a solid foundation from which we can move forward in a positive direction. The third area, beyond academic excellence and the student experience that I should address today is diversity and inclusion. By this I mean our work to create a diverse, inclusive, accessible and equitable campus and learning environment at Syracuse University. There has been progress in many areas here. I can’t inventory them all today. I am acutely following each of them. I just want to call out a few in particular right now. Just before holiday break, more than a thousand staff members from across this University attended a half-day program on “Understanding Bias,” facilitated by Kimberly Rattley. It was rigorous, it was engaging, it was high quality. Her keynote speech reflected her twenty-plus years of experience advising top institutions on understanding and addressing bias. This may be the largest staff development event in Syracuse University history, and I want to thank all the staff who attended, all the staff who indicated a personal commitment to diversity and inclusion and to growing and evolving Orange values in this area. Second, I want to point out that this coming semester we must drive to a successful conclusion our search for a Chief Diversity Officer. The search firm assisting the University in filling this important position spent days in December interviewing community members about our campus climate and the attributes required in successful candidates. The position profile has recently been posted. Candidates will be interviewed later in the semester. This is a position important to all of us. I hope to have the new appointee at work here on campus before the start of the fall semester. Building on the tremendous energy and work of Interim Chief Diversity Officer, Keith Alford, this new position will help us continue to focus on creating a more welcoming and diverse community. And finally in the area of diversity and inclusion, I want to report that we are very close to finalizing the hiring of a University Ombuds. I hope to announce the selection soon. 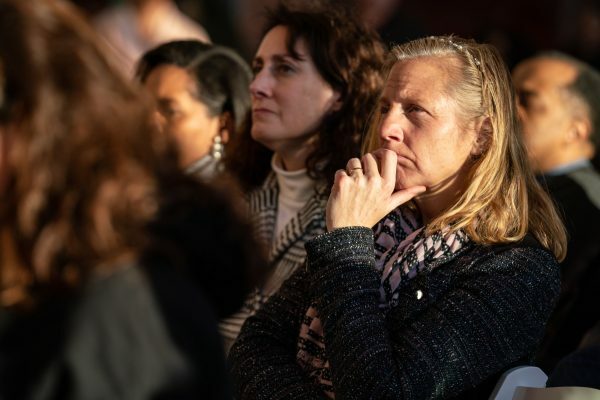 It is important for our campus community to have an informal, confidential, impartial, and independent resource to address concerns or questions openly without fear of retaliation or judgment. This is what our Ombuds will do. I’m excited we will have a new one soon. Lastly, as we work this semester to strengthen what it means to be Orange—in academics, student experience, and diversity and inclusion—we are also preparing for the recognition of Syracuse University’s sesquicentennial. Note that I said, “recognition” of our 150th birthday. There will be celebrations. But first and foremost, I view the sesquicentennial as an opportunity to take a humble and honest look at where we have been, where we are now, and where we are going as a University. As scholars and educators, we know that a clear-eyed examination of the past and a look at our present is such an important foundation to make sensible decisions for a solid future. By learning from times and places where Syracuse University has done the right thing, and times and places where we have stumbled—by looking at the good decisions and those that, in retrospect, were not as wise, we will be better equipped to chart our course. The committee that’s planning our sesquicentennial, say that five times fast! Our sesquicentennial is chaired by Sue Ballard and Bea Gonzalez, who are working on a yearlong series of wonderful events and activities incorporated into all our activities in all our units, and parts, and schools, and functions. It’s trying to capture our history and hopes and basically the evolving meaning of being Orange. Today, what it means to be Orange includes to be supportive of our community and appreciative of what others have invested in our success as well. One example here is Chloe Milliken. She’s a senior who is volunteering as the student veteran ambassador for her class giving campaign. Her appreciation of what it means to be Orange is shaped by her service in the Army. She was an ordnance disposal technician. She served in Afghanistan. She was awarded the Purple Heart, the Action Badge and the Army Commendation Medal for her service. And then she returned here in 2017 to study political science, with a focus on Middle East politics. She also interns for the Attorney General’s Office. She continues to serve the veteran community through her work as advisor in Student Veteran Career Services. She’s willing to give back by volunteering in the class giving program, in addition to her other activities and obligations, are a great example of someone who has truly earned the honor of wearing Orange like so many of you. So to end where I started, hidden in this little book was an admonition that wearing Syracuse Orange was an honor to be earned. Those who aspired to wear Orange knew that it must be earned and they were proud of the honor it conferred. 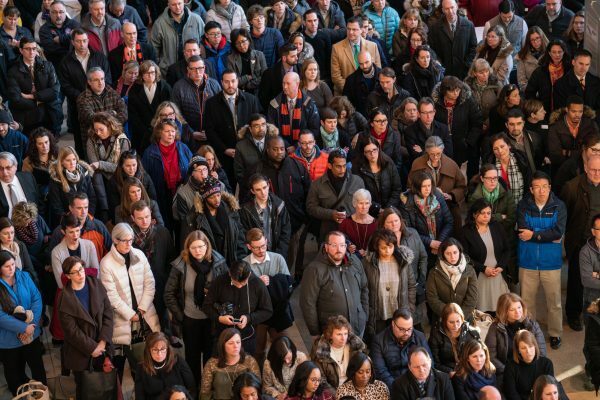 As we begin the spring semester and this New Year, in a very challenging world, I challenge you to show up as Orange everyday—as members of a community who are proud of all that we have accomplished—but not complacent with where we are. Wear Orange with pride, including freshman and sophomores, but also with the recognition that you earn the honor of being Orange through your commitment to our evolving common goals and values. Not to complacency, about where we have been alone in the past. Thank you for being here today. And please, Go Orange.